The monitor included in this horse trailer observation system is built to operate continuously while you’re driving down the road, the LED Screens we use are meant to show full color even in direct sunlight but will have a softer brightness that is very easy on the eyes while viewing at night. Both backup cameras in this system can be used as observation cameras that are continuously active even while you’re driving down the road. Whether you want to see the road behind you, change lanes or observe your prize horses in the trailer this system does it all. 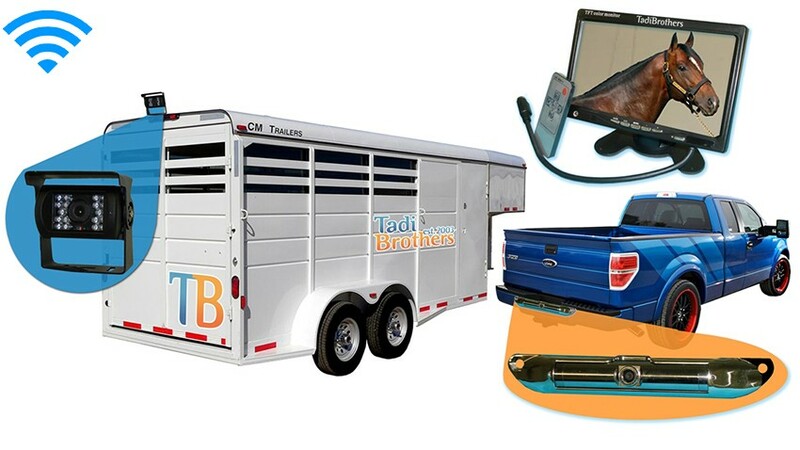 All backup camera sold by TadiBrothers come equipped with night vision, for those who want more detail in lower light, such as the inside of a horse trailer at night, we suggest upgrading to our CCD Hi-Def option at the top right of the page. This will provide enhanced night vision clarity with detail you will come rely on. Additional camera upgrades available are; changing the viewable angle from 120 degrees up to even 180 degrees, gridlines for perspective, or adding more cameras can be found at the top right of the page. The camera for inside the horse trailer included in this system features120 Degree viewable angle, its waterproof and has auto night vison. The camera is one of the most durable we have, with incredible adjustability and night vision clarity. The Horse trailer observation camera has a removable metal sun shield visor to protect you from glare and pebbles. It is usually mounted inside the trailer so you can observe your horses cautiously while you’re driving down the road day or night. Please note; we have C Clamp for the camera instead of bolting it, you can also use our battery packs and then it’s truly wireless and portable. The camera is encased in hardened metal to make it very durable and long lasting, The wireless horse trailer camera in this system is just as reliable as the wired version but with an easier installation. This horse trailer observation system comes with our standard 70ft wireless transmitters, they work very well in all types of vehicles from Sedans, trucks to RV and motors homes, they are 100% water proof and are very easy to install. For those want a longer range (up to 225ft) or you prefer the reliability of digital transition we suggest you upgrade the transmitters at the top right of the page, if you have an aluminum trailer we find that the digital upgrades always deliverers a better image.